The 2019 BMW Endurance Challenge from Daytona International Speedway was the opening round of the Michelin Endurance Challenge. The series which now features Michelin as the title sponsor, and sole tyre supplier sports two classes this year. Grand Sport which uses cars, based on SRO specification GT4 vehicles, and TCR. 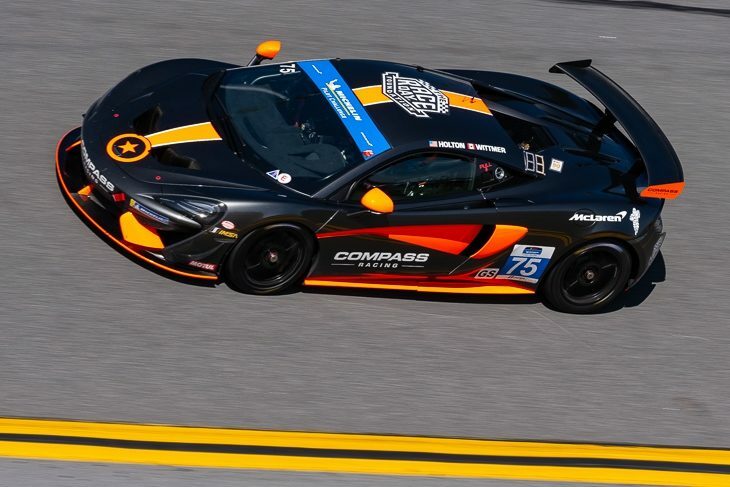 The #75 Compass Racing McLaren of Paul Holton and Kuno Wittmer took home the win, marking McLaren’s first ever win at the Daytona International Speedway. The long straights of Daytona played right into the hands of the #75 McLaren who benefited greatly from the straight-line speed of the Woking-built machine. The #75 McLaren started the race from pole, but Paul Holton would soon be handed a penalty as the result of jumping a restart. This sent the car all the way down to 30th position, where Wittmer worked the car all the way back up to the front. Wittmer made the pass for the lead on a late-race restart, going below the yellow line. That restart was looked at by race control but was deemed to be fair. “We’ve had in the past couple of years a showing that didn’t represent what we and the 570S GT4 could do, but this has come together and is a big step in the right direction,” said Holton after the race. Taking second in the class was the #99 Automatic Racing Aston Martin Vantage GT4 of Gary Ferrera and Kris Wilson. Wilson made his way past the #69 Motorsports in Action McLaren 570 GT4 and won a drag race to the line, after the MIA 570S GT4 suffered a fuel surge on the final lap. Jesse Lazare, Corey Fergus and the team started the race from the back of the GS field after being handed a post-qualifying penalty and worked their way back up to the front of the pack in the opening hours, going on to lead lengthy spells of the race after switching to an alternative pit strategy during a pit cycle. “Unfortunately the guys didn’t take out all the fuel when we weighed the car before the race, so the calculations were literally 0.5 of a kilo under. 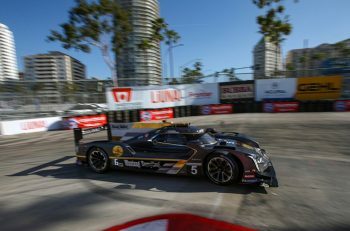 But fortunately Motorsports In Action gave us a great car,” Lazare told DSC after the race. 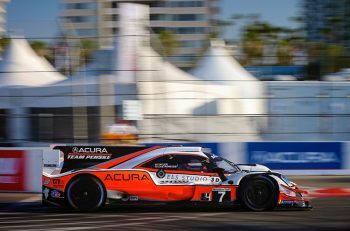 “Corey did a great job going from the very back to the front, and it was the same when I got in the car, we were on a very different strategy, I knew we were about 6 laps short of fuel, so I had to fuel save my whole stint. “We were hoping for a longer yellow in the end, we needed it to be four or five laps, but instead it was jut two. It cost us that position to the Aston, but it was a really close finish! LA Honda World Racing secured a 1-2 finish in TCR, the team benefiting from the missteps of others in the class. Taking the win was the #37 LA Honda World Racing Honda Civic TCR of Tom O’Gorman and Shelby Blackstock. They were followed by their teammates in the #73 LA Honda World Racing Honda Civic TCR with Mat Pombo and Mike LaMarra. The final step of the podium was taken by the #23 Fast MD Racing Audi RS3 LMS TCR of Nick Galante, James Vance, and Jared Salinsky. All three cars spent the final moments of the race battling for position after a later race restart bunched up the field. Restarts were not an uncommon sight this weekend for MPC, with nine full course yellows routinely bunching up the field.